Yesterday Jude and I attended a High Tea in Kyneton. It was organised by the Zetland Masonic Lodge up there for charity, raising funds for the Starlight Foundation. I’d never been to a High Tea before, and I was delighted by the experience. To your right was my place setting, note the beautiful tea cup, the little gift wrapped in a delicate lace handkerchief, the pile of cakes on a cake rack and the flowers. The treats served up were spectacular. 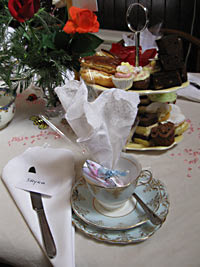 As well as the cake stand packed with sweet goodies, there were home made scones and cakes that came to the table. There were a number of raffles and auctions to raise money, I bought some raffle tickets but as we left before the drawer I gave them to a friend of mine. I wonder if she won anything! The auction prizes included some beautiful craft, quilts by local ladies, several art dolls and a number of hand made cushions as well as donated items from various businesses such as gardening gloves and gumboots (all decorated with painted roses), jewelery, pajamas (printed with flowers), tea sets (painted with roses) and more. There was much hilarity as the gentlemen of the lodge came out to parade the items one by one, often wearing the dresses/scarves and other items. There was also numerous cups of tea and coffee drunk by one and all. There was at least one tea pot on each table which was quickly and constantly replaced by the gents as the pots were drained dry. I burnt the bejesus out of my fingers by accepting a metal teapot by spout and bottom (the earnest young man was holding the handle) and managed to only spill a little of it on the table as my fingers blistered. 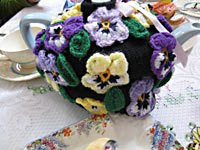 Below is one of the amazingly beautiful tea cosies, this one had a knitted black body and was covered with crocheted pansies. The lady who organised it was wonderful. She explained that although the teacups ranged from the 1880s to the 1950s, she loved the fact that they were being used. She doesn’t mind if occasionally one gets broken by someone, because the joy they bring people is worth it. Also, she argued, these were all built to be used, so hiding them away in cupboards negates the very object. Her collection has been shown at the Melbourne Museum, and will be on display in the Kyneton Museum in Feb next year. I’ll keep you posted with dates and addresses! The most beautiful thing she said was that bringing out teacups like these frees up people’s stories. 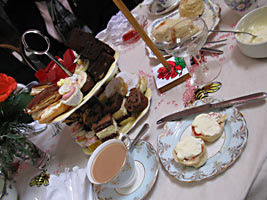 Older people reminise about High Teas they attended, and pass stories down to the younger generation. 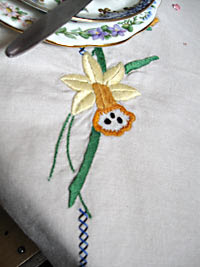 I thought this was a wonderful thing to note, as it had jsut happened at my table! The oldest lady had jsut finished telling us how as a very young girl she would go to High Tea at her grandmother’s house in the 1940s. Monday was wash day, Tuesday was baking day and Wednesday was High Tea. I had read that in The Gentle Arts, but I was thrilled to hear confirmation in person! She told us about the sponges that were made and consumed (jam and cream in the middle or passionfruit icing on top) and that all the ladies would be in their finest. And that was the wonderful thing about this High Tea, all the ladies were in their racing hat and fasinator finest. It was so beautiful to see! I highly encourage anyone who has the oppitunty to attend a High Tea to do so! It’s such a wonderful tradition and a beautiful specticle. O! how lovely that you write about such a beautiful day. 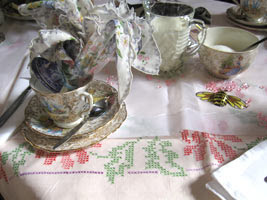 It does my heart a power of good knowing that your table was special and that the stories flowed like the tea!!! – I too had many memories of high teas from my past rush into my head dear new friend as I stood there in my "crinoline" "smiles"!!!! It was a beautiful day, and you and your lovely husband should be very proud of the work you guys put into the lodge. Indeed, I should think other people could learn a few things from the drive and energy you guys have 🙂 Please do keep us posted about the wonderful events you host. Previous post: so naughty, and yet totally work safe!